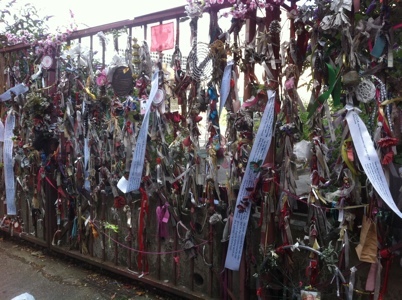 Turn into Redcross Way, only a few minutes’ walk from Borough High Street, and it’s hard to miss the colourful display of ribbons tied onto tall, sturdy gates blocking access to an overgrown and derelict site. But this isn’t just any old patch of waste ground, far from in fact, because archaeologists believe that the bodies of 15,000 prostitutes and other social outcasts were buried at the site. The ribbons remember a succession of victims stretching back over 800 years and along with the cases of vulnerable people all around the world that have died in more modern times. Today Crossbones, which was discovered during an archaeological dig by the Museum of London in the 1990s when the Jubilee Line was being constructed, faces an uphill struggle for survival as an open space. While campaigners want to turn it into a remembrance park, developers want to press ahead with their plans to build a development called Landmark Court. Battle lines are drawn for a fight. The graveyard has quite a history, going back to the time of the so-called ‘Winchester Geese’, the name given to the prostitutes who plied their trade from the brothels on land owned by the Bishops of Winchester on the south of London Bridge, an area known as Bankside. Many of these working women are believed to be buried here, probably from the 1160s, because they were denied a holy burial by the Church a given their ‘immoral’ line of work. London’s first historian John Stow makes reference to the site and the burial of the ‘single women’ here in his writings of the late 16th and early 17th centuries. Perhaps the biggest irony of the whole episode of these women not being allowed orthodox burials is that the Bishops made so much money out of the prostitutes, through fines and a share of earnings, during medieval times. Bankside, particularly around what is now Park Street, had numerous brothels (known as ‘stews’), with 18 recorded in the early 16th Century providing a useful revenue stream for the clergy who had their London residence at Winchester Palace on this stretch of the Thames. Outside the jurisdiction of the City’s authorities during medieval times, Bankside became a dumping ground for numerous outcasts, from criminals, migrants, vagrants and of course prostitutes. It was London’s most notorious red light district, an accolade helped by the fact that there had been a major effort to drive this ‘trade’ out from within the City walls across the river during the 1270s and 1380s. Of course the actual structures housing medieval brothels have long disappeared (although we have remnants like a 17th Century brothel key, which is now in the Cuming museum) but you can still trace these premises to modern day sites. The Anchor pub on the waterfront, the place where Shakespeare is believed to have enjoyed an ale or two on performances nights as it was so close his Globe theatre and where Samuel Pepys later witnessed the Great Fire of London, is said at some stage to have been a brothel. Further along the dockside towards the replica of the Globe at Cardinal’s Wharf stand some fine 18th Century homes, which are among the oldest constructions in the area. Number 49, built in 1710, is the site of the Cardinal’s Cap Inn which once a brothel and was said to have been popular with ferrymen. But one of the most notorious and luxurious stews was the Holland’s Leaguer, located on a site today known as Holland Street and in what was formerly a manor houses in a then landscaped area called Paris Garden. It gained notoriety in the 1630s when it was run by a ‘women of ill disrepute’ called Elizabeth Bess Holland, hence the brothel’s name, and include a portcullis with a moat and draw bridge. Authorities from across the river were repeatedly trying to shut the brothel down because it was becoming so notorious and there is a fascinating episode where Bess entices soldiers onto the bridge and then orders the platform to be pulled up so they fall into the water. Prostitutes also emptied their chamber pots over the heads of the soldiers. With such colourful episodes, it’s no wonder that Holland Leaguer was made the setting for a play of the same name. Although brothels thrived in Medieval times, prostitution on Bankside can be traced to when the area was a Roman settlement and slave girls provided services for the crews of ships and also perhaps the military that had barracks on this stretch. But the ‘trade’ was essentially legalised on the south bank in 1162 when parliamentary ordinances were issued ‘regarding the government of stewholders in Southwark, under the direction of the Lord Bishop of Winchester’. There were some restrictions however in that the brothels were not permitted to be open on Sundays or religious days. There was also some attempt to stop prostitution getting out of hand, with the text noting a fine of twenty shillings should any ‘woman of the bordello… draw any man by his gown or by his hood or any other thing’. And the ordinances were meant to protect the prostitutes as well, through requiring that women were not held against their will. Whether that actually happened is up for debate. We have some fascinating poll tax records documenting the extent of the ‘trade’, including those from 1381 recording seven local ‘stew-mongers’ each keeping between two and six ‘servants’, the latter probably a mix of both servants and prostitutes. Others are said to have worked on a ‘freelance’ basis operating out of the likes of Paris Garden, the manor next to the Clink, or St Thomas’ Hospital, more of which later. Shakespeare makes reference to brothels in his play Henry VI, whereby the Duke of Gloucester accuses the Bishop of Winchester of giving ‘whores indulgence of sin’, suggesting that the church, which profited from prostitution, was questioning is questioning its morality. We know however that the ‘trade’ was so profitable that in Shakespeare’s playhouse owners would also own brothels. Later, the Puritans imposed strict laws for both prostitutes and their clients in the aftermath of their Civil War victory in the 1640s, including threat of the death penalty for anyone caught in the act. But this had little impact on the brothels themselves as they had been in decline for some time, with the trade forced out onto the streets as had been the case when Henry VIII tried to ban it. Prostitution continued in Bankside and wider Southwark when the area became heavily industrialised during the 18th and 19th Centuries. And the continues today, informally right across the capital. Authorities will in fact never be able to stop what some have called the ‘oldest trade in the world.’ With prostitution playing such an important part in the history of Borough and Southwark it would be a shame if this site, a reminder of a life lived in obscurity, is also lost forever.